• What is the meaning of the protests that have taken place in Iran since 28 December 2018? • Will the protests continue? • Is this the beginning of a revolution? • Can the state control and repress the protests? I argue that what emerged in late December in the streets of Iran was the activism of a “passive revolution.” I am using “passive revolution” here as term a term coined by Antonio Gramsci to refer to the deep transformations that has been happening in Iranian society since the 1979 revolution. On 5 Oct 2017 in cities across Iran Teachers protests low wages and inadequate work conditions. This photo is from city of Rasht. 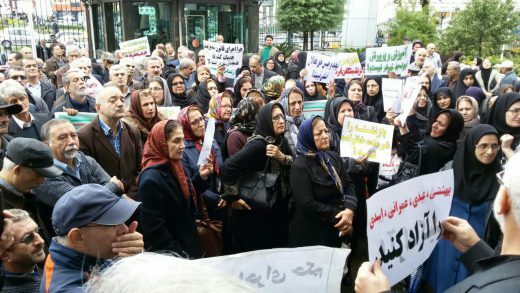 These protests were predecessors of the winter 2018 unrest in Iran. This transformation will reach its determinant point when the regime in Iran is forced to hold elections for a vote on its legitimacy. To force this on the regime, the first step is a trench-by-trench battle. Simply relying on street battles is dangerous. All trenches in civil society have to be occupied. What Is Happening in the Lower Depths? The events that began with the protests in Mashhad on 28 December 2018, were not sudden or without precedent. They were tied to a series of other events which were immediate reactions to poverty, high prices, inflation and unemployment. The sound of people’s protest against discrimination, corruption and mismanagement were reflected everywhere, even in state media and establishments. Poverty, risen prices and unemployment are crushing the masses. Discrimination, corruption and mismanagement are undeniable facts. However, all these factors do not explain the quality and depth of the gap that is spanning between the people on the streets and the political system of the Islamic Republic which is based on the guardianship of a jurist. The current events are not of the kinds that occur daily in every corner of the world. They are not only defined by immediate motivations including poverty and economic corruption. That is why we have to ask what is happening in the depths of the Iranian society. The events in Iran, of which we have seen manifestations in 2009 and even before, are the consequences of a “passive revolution” by which I mean a slow and lengthy structural change. In Antonio Gramsci’s words, it is a revolution “without a revolution” (1), or in our case, without a noticeable transformation in political power. Since 1979, Iran has been transforming in a fundamental way. However, this transformation has not reflected itself in the realm of politics. The regime is still that old structure whose cracks have been repaired here and there. Ahmad Jannati, the secretary general of the Guardian Council is truly the symbol of this regime. He symbolizes the power mechanism that determines who and what groups can be present in the realm of political power in Iran. He is an old and decrepit man who wants to make decisions for the youth. Some of the rebellious youth on the street are the children of the very people who constitute the base of the Islamic state. Since 1979, Iran has undergone fundamental transformations in population size, urban to rural proportions, expansion of capitalist relations, social mobility, family structure, the relationship between the individual and society, women and men, young and old, values and beliefs, consumption patterns, the understanding of time, communication with the world, and self-perception. These have been revolutionary changes comparable to structural changes which took place from the end of the Qajar dynasty (1785-1925) until the establishment of the Pahlavi dynasty in 1925. During the reign of the Pahlavis, the state and the governments supported some structural changes and to some extent promoted them in certain realms. Now, the Islamic Republic of Iran (IRI) has fallen behind from progress. To the extent that when IRI does promote change, it often finds the outcome to be problematic for the existence of the state. For instance, IRI in the past 40 years has tried to expand capitalist relations. This has lead to drawing the rural population into the cities and the expansion of urban life. However, the Islamic state finds urban culture problematic and does not understand the demands of an urban life and an urban population. To the extent that the state attempts to confront urban citizens by disciplining them to become a state-desired type of urban citizens –to have other demands and needs. Essentially finding urban population problematic, the state attempts to turn them into something else. However, these disciplining efforts often fail and bring about other problems. In a way, the last Pahlavi’s regime also had this problem. It promoted modernization but could nor understand that it also had to abide by the demands of democratization. It is not possible to promote urban life and literacy among the citizen and simultaneously expand censorship and political control. Structural changes have not been the immediate cause of the crises of the past 40 years. Crises in Iran are rooted in a fundamental problem that the 1979 revolution could not resolve -problems which in the context of structural changes, have once again turned into a social volcano about to erupt. The problem concerns confluence, participation and integration. Under the rule of Mohammad Reza Shah Pahlavi, Iranian society was transformed in a planned way under the banner of the “White Revolution”- a series of structural and economical reforms funded by oil revenue in Iran from 1963 to 1978 including land reform changing the structural relations between the landlords and presents, support for industrial growth and for the private sector. During Shah’s White Revolution, structures crumbled but the masses that were pushed out rural areas by that transformation were not completely absorbed by the new capitalist structure. In other words, they were not integrated. The manifestation of the problem of integration could be seen in the masses of rural people who sought refuge in the cities but found little chance of integration in them. Living in the margins of cities expanded, and those living in the margins created problems. Living in the margins became widespread, including in the realm of culture. Powerful values were marginalized. The margins became more powerful than the center. On the other hand however, modernist social groups also had an integration or participation problem. The category, “regime” in its more fundamental sense refers to the type of confluence and structural formation and the attitude of institutions and centers in the realm of political power. In this respect, the Shah’s regime was closed to other groups including modernist social groups. Only a small sector had the opportunity to participate in it. Participation was defined by dictatorial power. This problem existed from the time of the first Pahlavi king Reza Shah who repressed both the clergy and the modernists. On the one hand Reza Shah pushed out the likes of modernist politicians like Abdolhossein Teymurtash (1883–1933) and Ali-Akbar Davar (1885–1937). On the other hand he put “the Group of 53” on trial – a group of 53 leftist intellectuals, writers and activists that symbolized the leftist modernists that were arrested in 1937 and brought to trial in November 1938 during the reign of Reza Pahlavi. The struggle between various actors in powers during the reign of the Mohammad Reza Shah Pahlavi constituted a triangle: The center of power, the traditionalists and the modernists. This triangle gave two foundations to the 1979 Iranian revolution: the modernists and on the traditionalists  together revolted against the Shah. Of course the revolutionary scene was not this black and white. Among the traditionalists, there were those who were influenced by modernity, and among the modernists, there were those who had a tendency toward traditionalism. Iranian ideology (i.e. what characterizes the relatively dominant world view in our society) in transition is a hodgepodge of modern and traditional elements. The traditionalists became victorious during the 1979 revolution. However, this victory was not predetermined and its signs were not evident in the preceding years. A coalition led by modernists could have become the leaders of the revolution. However, in that case most of the aristocracy of the clergy would have sided with the monarchy. A revolution with two foundations ended with the leadership of only one of its starting forces: the traditionalists. Khomeini and his group pushed out the modernists. After cutting the access of modernists to power, the victorious Khomeini and traditionalists embarked on a bloody suppression of the resistance forces. The Massacre of 1988 was the end point of this stage of entrenchment of Islamic power – when the state executed some 4000 political prisoners across Iran. From its beginning, the new power set the integration of the marginalized as part of its social and economic agenda. A type of “social state” was established. Factories found new managers. New faces were in charge in government offices. A radical change was made in the management cadre of the country. Those who found their way to the top floors of the tower of power had not even dreamed of such a rise. With a change in the system of privilege, the rules of capitalist relations expanded. Under the reign of Mohammad Reza Shah, a minimal level of economic capital or symbolic capital (degree or expertise) was required for becoming “privileged”, for moving up the ladder. During the reign of the Pahlavis, passing through the more or less invisible wall of political and behavior based selection, and having the necessary social capital (connections and favoritism) accommodated socioeconomic rise of an individual. The Islamic Republic created important changes in this system of privilege and socioeconomic rise. During the first years of the revolution, IRI opened the doors to sectors of the “oppressed” and replaced the previous invisible wall with the visible wall of ideologically based selection. The new system was established with fundamental changes in the system of privilege promotion. It also preserved some of the previous regime’s elements and structures. The needs of the new system on the one hand and the efforts of the middle and wealthy classes for self-preservation on the other hand, meant that modernists also entered the system of power to some extent. Their religious segment became the instigators of the reformist movement. The new system of privilege promotion created the proper environment for the growth of a type of capitalist who would be called the “Islamic bourgeoisie” because it benefited from the theocracy’s crony capitalism. It is on the basis of the system of privilege promotion that religion in Iran has been turned into an effective analytic factor in political economy. Like other currencies, religion as a currency might lose its value too, if there is inflation. And now this misfortune has gripped the value of religion in Iran. Islamization in Iran was understood as the printing of masses of bills – showing money owed for religion and religious behavior. These bills were produced to the point of becoming value-less. This loss of value signifies the dissatisfaction of the “insiders.” The insider was one who had a great deal of religious currency and could exchange it for economic currency or for a rank within the system. However, the insiders no longer have the power to exchange their currency nor the ranks to occupy. The insiders are fighting over occupying the [existing] ranks but can no longer promote their struggle for power by relying on religious capital alone. The religion enterprise has gone bankrupt. The possibility of using religion to pay for the system’s costs and to resolve its general crisis has become very limited. The religious currency which had suddenly gained value, led to the self-destruction of religious communities. They decided to exchange that currency – that is their religious capital, their link to the system – for money, for educational degrees and for gaining posts and ranks. Religion turned into banks, it turned into various economic, ideological, media and security enterprises; business after business was opened and fake goods also became widespread. Heavy regulations were imposed on all these currency exchanges. The commodity of religion had to abide by the rules of supply and demand. To the extent that this cycle continued, it was first and foremost thanks to the income from the sale of oil. So long as the oil income was high, the cycle could continue despite its dilapidation. However, now there is no balance between income and expenses. The Islamic state is a massive bureaucracy surrounded by many ideological and security organizations that are like bottomless pits and have an insatiable thirst for budget. Iran today is not the Iran of 1979. Social dynamism has become widespread. Social gaps have increased. Capitalism has uprooted all rural areas. Villages have connected to cities but have become isolated from urban centers. Money has gained the main role in the social value system – it has become the determinant; it has imposed greed and ruthlessness on human relations. Society has become fragmented with fissures that can each cause a massive earthquake. In this situation, the fundamental and determinant fissure is the gap between the government and the people. In the past, the specific situation of the ruling system reduced the threat posed by this gap –particularly because the center of power was surrounded by a wide range of people who supported the political system. This protective ring of people surrounding the political system somehow covered the fissure that separated the political system from the rest of the citizens. Those citizens, who served the function of the protective ring, often changed role –they often played a dual role. They appeared as defenders of the system when in the position of being receivers of privileges. They appeared as opponents of the system when they saw themselves as having been denied these privileges. This dual role became the source for the hypocrisy that polluted the ethical social sphere in Iran. Now however, even that protective ring of citizens covering the fissures has been cracked. The political actors that played these dual roles, including the reformists, have to act upon their words and determine where they stand. The epochs of social movements are always ethically cleansing. People join in solidarity and become nicer to each other. They direct their anger at the common enemy. Structural transformations, what we called the “Passive Revolution” has broken the wall of separation between the traditionalist and the modernist segments of Iran. To the extent that there still is a wall of separation, it is the remnant of a destroyed wall here and there. This does not mean that the society has become modernized. The disorder and confusion of the period of transition is palpable everywhere. Bifurcation can be seen in people’s minds. A broken wall remains in their minds and will need time to be removed. In the epochs of social movements, time goes by fast. We need not wait for too long. In the Green Movement, we returned to the dualism of “them – us “. This was a manifestation of a structural transformation. In the Green Movement, the “passive revolution” gained an active manifestation. Certain signs had been seen in advance during the period of “reconstruction,” the period of Khatami and specifically the July 1999 student insurrection. In the Green Movement, the role of the urban middle class was prominent. Now, in the “Dey” [December 2017-January 2018] movement, it is the deprived impoverished citizens who play the prominent role. The fissure here is within the very depths of the system of privilege promotion. The prelude to the movement which began this winter in Iran was the persistent wave of strikes and labor protests and actions of the working class for the past two years. It also included protests by those who had lost their meager incomes in bankrupt credit institutions. The toilers and the dispossessed in the privilege-promotion system of the Guardianship of the Jurist are the vanguards of the current movement. The “passive revolution” has become active. It wants to be recognized. The base wants a superstructure that is compatible with it. Therefore, the movement will continue. It has the objective capacity for continuing. Its repression had already started before it began. Repression will continue and will be intensified. No one can predict with certainty whether it will be temporarily restrained or run out of steam. Anything is possible. The regime’s internal confusion benefits the movement. However, on the other hand, the movement will compel the center of power to intensify and unify itself to stand in front of the movement. The movement showed its power during its very first days. Its power was not in its acts of violence or its angry slogans but its rapid spread to all the corners of the country. People rose up in small cities. One of the consequences of the aforementioned structural revolution is this visible continuity and contagiousness of the protests. Therefore, can we be certain that the movement will continue? No, there are conditions. First, in order to examine the conditions for the continuity of the movement, we have to clarify what we mean by the concept of “revolution.” Have the events which stared in December begun a revolution? If by “revolution” we mean a fundamental transformation which leads to regime change and dismantling of the dominant system of privilege promotion, yes, we have stepped on to the path leading to a revolution. However, if by revolution we mean a confrontation between two fronts which would end with an event like the 11 February 1979 [overthrow of the Pahlavi regime in Iran by revolutionary forces], events might not follow this classic pattern. The classic pattern for revolutions applies clearly to regimes that are known as “hollow.” The regime of the Islamic Republic is not hollow. This is not meant to praise it or to give it credit. Rather, it is meant to pay attention to the social base that should not be underestimated. In determining the degree of the regime’s popularity, the measure should not be what people say about it in private or even in the streets. Rather, the measure should be the strength of its privilege promotion system. A large segment of the population is indebted to this regime. They have gained privileges by relying on it. At the same time, based on the biter experience of the 1979 revolution, they might think that the situation would get worse if the regime is overthrown. They might not support the government but don’t defend the movement either. The key point is that various social groups in Iran are much more self-aware than they were in 1979. They have experienced a major revolution, various political organizations, an eight-year war, electoral battles within the context of the government, the reform period, crushing foreign sanctions and the Green Movement. They have been arguing for 40 years. Those who have gained privileges are no less than the Nomenklatura of the Shah’s period. The military leaders are not weaklings like those under the Shah. Those who have shares in the corporation of the Islamic Republic are much more conscious and determined than the elite under the Shah. Religion still pays its role. The history of religion is the history of seeking refuge under this or that God and this or that prophet. The umbrella of religion is still open. There will certainly be a refuge, a source of support, and a barricade under it. Lenin, the master of revolution, defines a revolutionary situation as having three characteristics: Those at the top are unable to maintain their rule, those at the bottom are unable to tolerate the pain and suffering, and thus gain the spirit and determination to revolt. The situation becomes more complex if those at the top are not a limited group, if the political system is tied to a system of privilege promotion, if those at the bottom are not homogenous, if there are protective segments with different roles between those at the top and those at the bottom, and if all at the bottom do not share the same spirit and determination. The process of transformation might be longer. In political theory, this situation is defined as “transformation.” (3). Transformation as a category with a prescriptive sense is closer to reform. However, here its application is descriptive. It defines a situation in which the process of transformation is more complex than the patterns of a united front and checkmate in the chess game of politics. The other side might often turn the Pawn into a Queen and transform the scene. “Transformation” also has a climax. That is where transformation becomes irreversible. That is a situation in which the regime is forced to call for a vote on its legitimacy, and the people gain control of the electoral process. The danger of repression exists. The danger of a civil war is still not very high because the urban composition of Iranian society, the general culture of the people, the strength of the adherence among fellow citizens and the improbability of conflict between one segment of the armed forces with another. However a low probability is not an improbability. If we want to take this danger more seriously; if we want to increase the civil spirit of the resistance; if we set the complex pattern of transformation as our basis, then what can help us think about a long-term movement and hence push back the repression is not a quick revolutionary turn. In this situation, trench by trench resistance, as the method of struggle, an idea developed by Antonio Gramsci (4), seems to be the optimum method. Civil Society is full of trenches. The regime has to be pushed back from all these trenches: Factories, universities, offices, various associations, even parks, even mosques . . . All have to be occupied. Street protests matter. However, what can change destiny, what can neutralize any repression is the occupation of all trenches. In each trench, the regime has to be delegitimized. A movement for self-determination has to be aroused so that people, everywhere, can take matters into their own hands. The experiences of various countries shows that occupied trenches join each other and put pressure on a regime to the point where it would have to call for a vote on its continuation. Then we will enter a new period in which “transformation” would have to establish and cleanse itself and turn into an irreversible democratic development. Leadership will form itself in the course of the trench by trench struggle. A real opposition (5) is one that captures a trench and is able to hold on to it. 1. On Gramsci, see David Forgacs (Editor), The Antonio Gramsci Reader. Selected Writings 1916-1935 NYU Press 2000, p 246ff. 4. Antonio Gramsci, Op.Cit. p. 430.